Galaxies are not randomly distributed in space; they swarm together, gathered up by the unyielding hand of gravity, to form groups and clusters. The Milky Way is a member of the Local Group, which is part of the Virgo Cluster, which in turn is part of the 100,000-galaxy-strong Laniakea Supercluster. The galaxy cluster seen in this image is known as SDSS J0333+0651. Clusters such as this can help astronomers understand the distant—and therefore early—universe. SDSS J0333+0651 was imaged as part of a study of star formation in far-flung galaxies. Star-forming regions are typically not very large, stretching out for a few hundred light-years at most, so it is difficult for telescopes to resolve them at a distance. 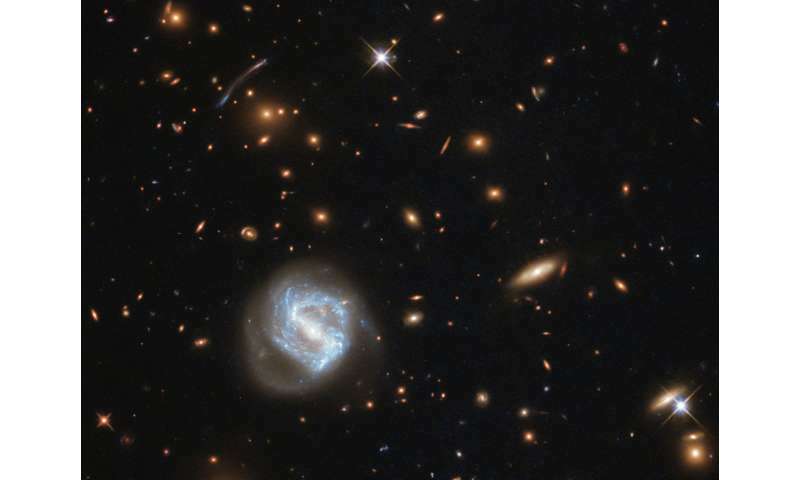 Even using its most sensitive and highest-resolution cameras, Hubble can't resolve very distant star-forming regions, so astronomers use a cosmic trick: they search instead for galaxy clusters, which have a gravitational influence so immense that they warp the space-time around them. This distortion acts like a lens, magnifying the light of galaxies (and their star-forming regions) sitting far behind the cluster and producing elongated arcs like the one seen in the upper left part of this image.